Our charming guest rooms in Burgundy; on the road to Saint Fargeau. This story could be the plot of a historical novel. Yet this enigma is very real. At the castle of Saint Fargeau, a painting of the painter David would be hidden in the walls of the building. The painting depicts the assassination of Louis-Michel Lepeletier, Marquis de Saint Fargeau. A work estimated at several million Euros. Excavations were made to try to find this masterpiece but without success. The medieval walls of the castle are 3, 70 meters thick. Louis-Michel Lepeletier was a revolutionary aristocrat. A noble who defends the cause of the third estate. In 1789, he was elected deputy of the nobility at the States General. He sits on the left of the assembly with the Montagnards. After taking the Bastille, he renounced his seigniorial rights and removed his name: Saint Fargeau to keep only Lepeletier. On June 21, 1790, he was elected president of the National Assembly. On this historic day of January 15, 1793, following his trial, the King of France, Louis XVI is declared guilty, and Lepeletier will be one of the deputies who will vote for the death of the king. Death got to a close voice. The day before the execution of King Louis XVI, guillotined January 21, 1793, Lepeletier dines in a Parisian restaurant. A man comes up to him and shouts, « It is you scoundrel who voted for the death of the king. Lepeletier replies: I voted according to my conscience; and what does it matter to you? The man, who is no other than an old royal guard of Louis XVI, pierces him with his sword. Lepeletier will die a few hours later. Death for voting the death of the king. Lepeletier becomes the first martyr of the revolution. National funerals are organized. He will be buried in the Pantheon. The painter David, also a deputy who also voted the death of the king decides to pay tribute to him by making a painting. This work, called Lepeletier de Saint Fargeau on his deathbed was hanging next to another painting by the painter: Marat assassinated at the Convention (former National Assembly). To this day, murdered Marat is at the Museum of Fine Arts in Brussels, where the painter finished his days after a forced exile. 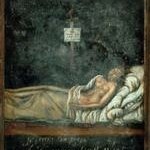 But for the painting representing Lepeletier on his deathbed, no trace. Could it be Suzanne, his daughter who became a royalist, would have bought this painting for a considerable sum in order to burn it and thus erase the image of his regicide father. Thesis supported by art historian Simon Lee, professor at the University of Reading (England). Another version says that Suzanne concealed the painting in the walls of the castle. Today, in the chapel of the castle of Saint Fargeau, sit the bodies of Suzanne and her father Louis-Michel Lepeletier, whose body was finally exhumed from the Pantheon. On your way to Saint Fargeau, you can have accommodation in our charming guest rooms in Burgundy.